Sally Golding is finally putting the past behind her. 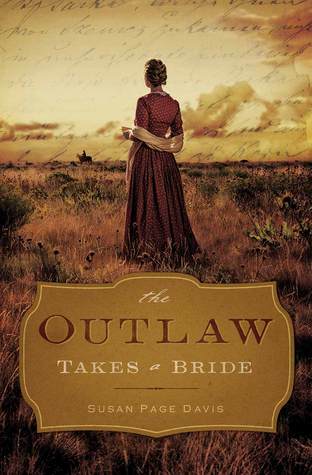 The young widow regrets the unhappy state of her first marriage, but the promise of a new life and a loving husband in rancher Mark Paynter - a man with whom she's been writing letters - has her on a train from St. Louis to Beaumonth, Texas. Mark's brother, Johnny Paynter, flees Denver to escape being hanged for a murder he didn't commit. At his brother's ranch in Texas, where he planned to take refuge, he finds Mark, dead at the hands of rogue bandits wreaking havoc on the countryside. Taking advantage of his uncanny resemblance to Mark, Johnny assumes his dead brother's identity. Soon Sally arrives and derails Johnny's plans. Seeing no other option, Johnny makes a fateful decision to go through with the wedding as Mark. With such deception between the two newly-weds, and the possible return of Mark's murderers, can this unlikely outlaw and widow find love? This book took me a few chapters to really get into it, and at times I felt like just throwing it over my shoulder and giving up on it. I did finish reading the book, and while it improved as the story went along, it left me feeling frustrated. Does Johnny come clean and tell Sally everything? Can Johnny and Sally make their marriage work? Is Johnny's innocence ever discovered? Are Mark's murderers ever brought to justice?